Home Opinion American Muslims Share the Dreams of Dr. Martin Luther King Jr.
American Muslims Share the Dreams of Dr. Martin Luther King Jr.
Dr. Martin Luther King Jr. was world renowned for his eloquent speeches calling for freedom from racial discrimination and oppression of African American people. America and the world owes a debt to Dr. King for his struggle and sacrifices. Ironically, Dr. King’s birthday falls within the Christmas season, as Muslims have joined with Christians in the Glorification of Almighty God and in expressing love for Jesus the son of Chaste Mary, peace and blessings be upon them. The speeches of Dr. King gave inspiration to an entire generation of American Muslims who were also striving for freedom, justice, and equality, and continue to be a source of inspiration to people of all nationalities and persuasions. Dr. King’s famous “I Have a Dream” speech, which he delivered on the steps of the Lincoln Memorial in Washington DC, on August 28, 1963, before a crowd of 300,000 civil rights demonstrators, became a rallying cry for all Americans. Dr. King possessed a vision of an America where every American enjoys equal rights under the law, where true justice is given to all people and where, “people are judged not by the color of their skin but by the content of their character”. 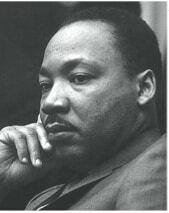 Dr. King declared that, “we are God’s children and we don’t have to live the way we are being forced to live.” Dr. King said that oppressed people must join hands because, “if we don’t go up together, then we will go down together”, for freedom from oppression is a basic human right enjoined by The Almighty Creator, that must be ensured to every human being. Martin Luther King, Jr. (January 15, 1929 – April 4, 1968) was an American clergyman, activist, and prominent leader in the African American civil rights movement. He is best known for being an iconic figure known in the advancement of civil rights in the United States and around the world, using nonviolent methods following the teachings of Mahatma Gandhi.